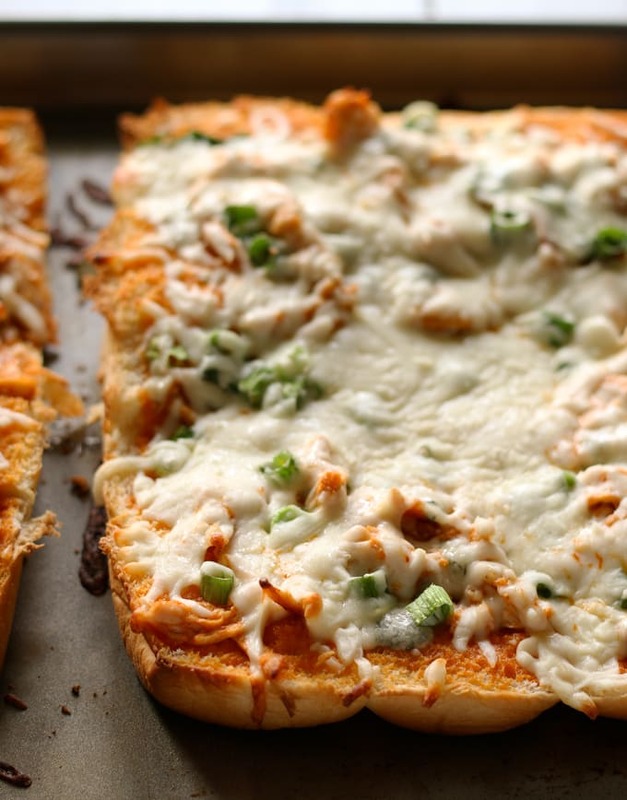 This buffalo chicken pizza bread recipe is going to be a hit at your next party! It’s made with KING’S HAWAIIAN® Sweet Bread Rolls for easy eating! If you’re looking for game day recipes, this is the perfect appetizer! We are in the heart of party season and all I can think about is food. This is actually something I say often (at least once a month) but I really feel it’s truth during the holidays. Every party and event I attend always has the most delicious food. I think people are more indulgent in the month of December and food always seems to be more flavorful. It’s all quite glorious. And delicious. If you are hosting a party, you probably feel the pressure to make every food item you serve be as appetizing and delectable as possible. I totally know how you feel. Earlier in the month, when I hosted my cooking baking party, I was in your shoes. I knew that even though we would be making some really great cookies, that wasn’t all we could eat. 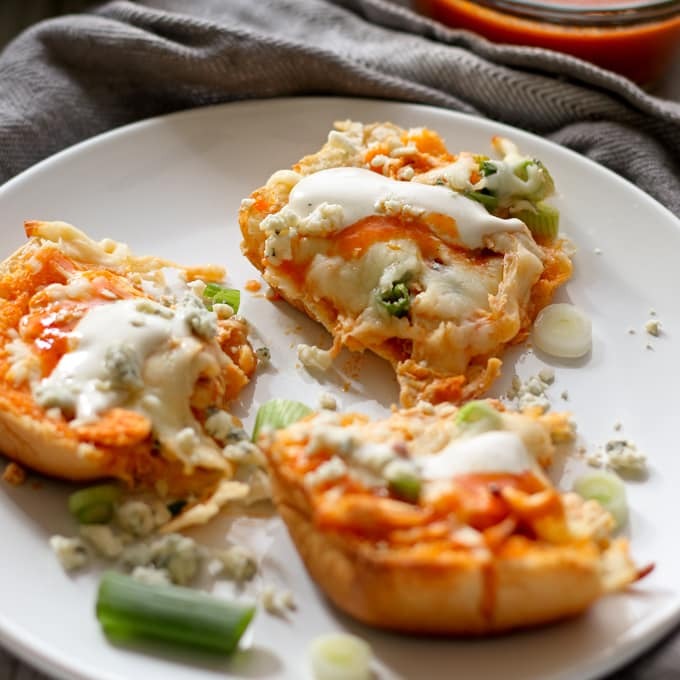 So I got to thinking and created a really easy recipe for Buffalo Chicken Pizza Bread using KING’S HAWAIIAN® Original Hawaiian Sweet Dinner Rolls. 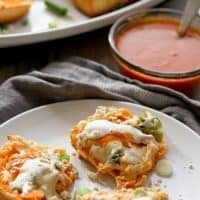 My easy homemade buffalo sauce recipe and KING’S HAWAIIAN® Original Hawaiian Sweet Dinner Rolls were meant to be paired together; at least that is what I discovered when I started creating this pizza bread recipe. The tangy flavor of buffalo sauce compliments the sweet taste of the dinner rolls; add some blue cheese and green onions and you have a great snack on your hands. Also, in your hands. Yum! Open up a package of Sweet Dinner Rolls and peel the package away carefully so as not to separate any of the rolls. Using a sharp knife, cut the entire loaf of rolls in half so that you have two large pieces of bread to assemble your pizza on. Pour a little buffalo sauce in a bowl and toss the shredded chicken in it until covered. Then brush a thick layer of buffalo sauce on top of the bread. After that you just assemble your pizzas and throw them in the oven. Because the rolls have already been baked and the chicken is already cooked, it doesn’t take very long to bake your pizza bread. Super melty cheese is the goal here! When you remove the buffalo chicken pizza bread from the oven, use a knife to score the cheese. 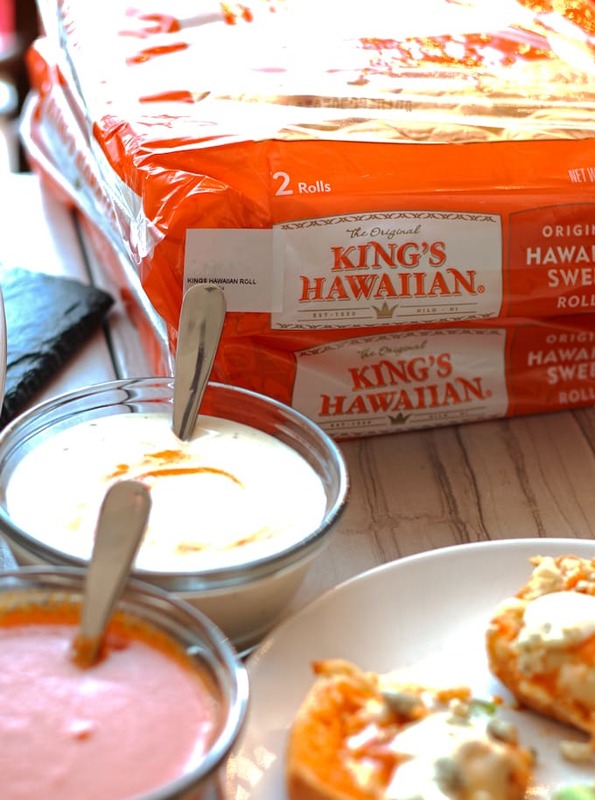 After that, it’s easy peezy because this is made with KING’S HAWAIIAN® Original Hawaiian Sweet Dinner Rolls. Your guests can easily pull them apart and believe me, they will. 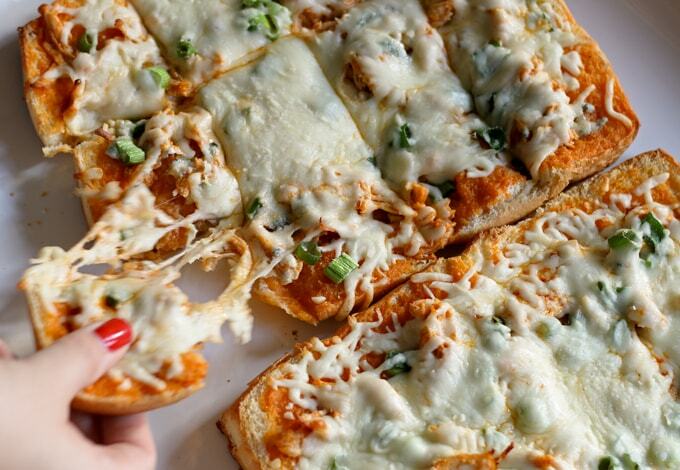 It’s hard to turn down buffalo chicken pizza bread. All of your holiday shopping essentials can be found at your local Walmart and make sure you don’t forget the KING’S HAWAIIAN® products while you’re there! For more tips on holiday entertaining and recipe ideas with KING’S HAWAIIAN® head to Evite.com. 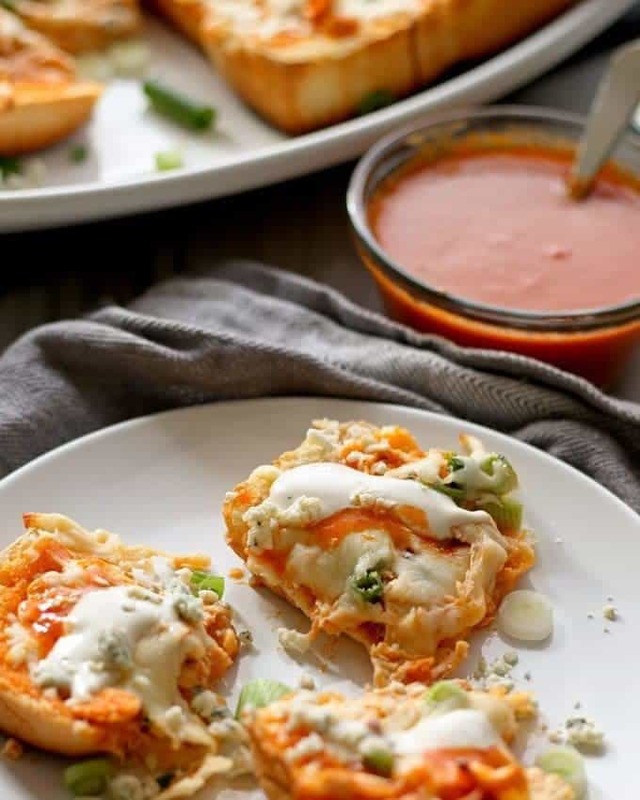 This buffalo chicken pizza bread recipe is going to be a hit at your next party! It's made with KING’S HAWAIIAN® Sweet Bread Rolls for easy eating! Preheat oven to 350 degrees. In a small bowl, toss the chicken and 1/2 of the buffalo sauce together until chicken is well coated. Set aside. Use a sharp knife to slice the entire loaf of KING’S HAWAIIAN® Original Hawaiian Sweet Dinner Rolls in half, being careful not to separate the dinner rolls. Place both halves on a cookie sheet, with the flat side up. Use a brush to coat both halves with the remaining buffalo sauce. Assemble your pizza bread. 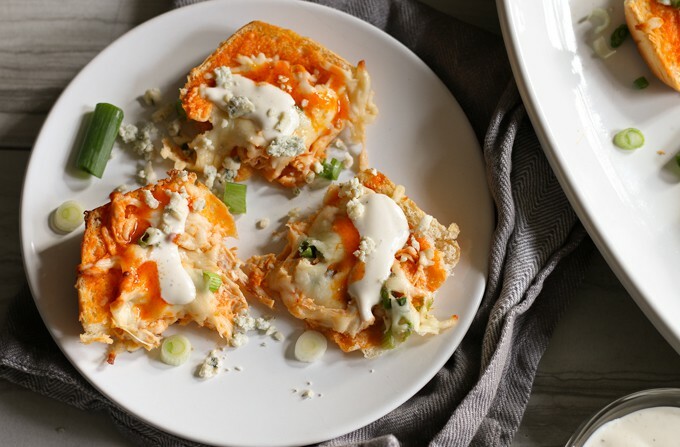 Sprinkle the buffalo chicken, green onions and blue cheese crumbles on top of the buffalo sauce, then cover with shredded mozzarella cheese. Place cookie sheet in the oven and bake for 12-15 minutes, or until the cheese has melted. Remove from oven and let cool for 5 minutes before serving. Thank you to KING’S HAWAIIAN® for sponsoring this post! I absolutely love how eay this is–totally need to do this for my next pizza night! What a fun twist! Double win! Kings Hawaiian rolls and buffalo chicken? Yum! Looks awesome. Oh how I love buffalo chicken flavored meals! These pizza breads would be devoured in minutes at our house! Delicious!! I love Kings Hawaiian, in fact my kids have t almost everyday in their lunch boxes in some form! What a fun recipe! I loooove anything “Buffalo” and paired with King’s Hawaiian Rolls?! Great idea!! I’m all about the food too! I have three parties to attend this week and I can’t wait. This would be a great addition. I love Hawaiian King rolls! My son will love these. No way, this is genius. I must do this soon. My family would totally go for this and finish in no time. What a great idea! I see this pizza bread in my very near future. Looks delish! Whoa just whoa! This looks INCREDIBLE!! 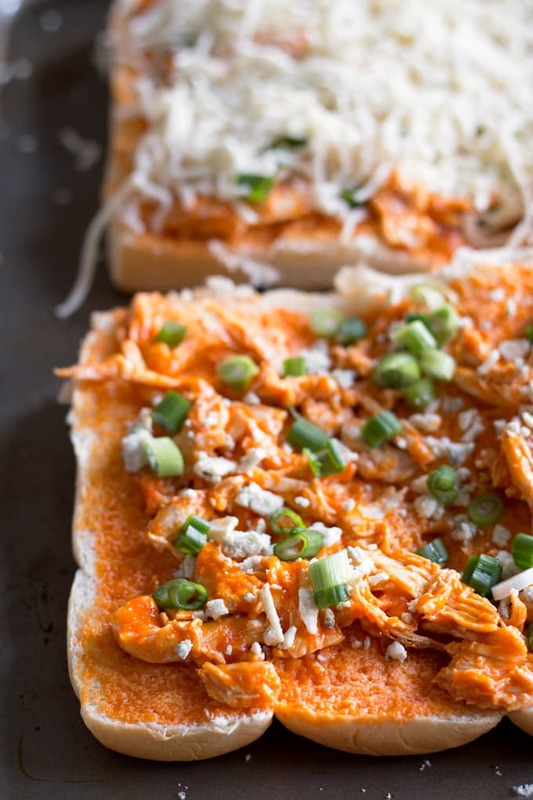 We are such buffalo chicken fanatics here I love how simple this is to throw together! These are all of my favorite words in one title! Yum! 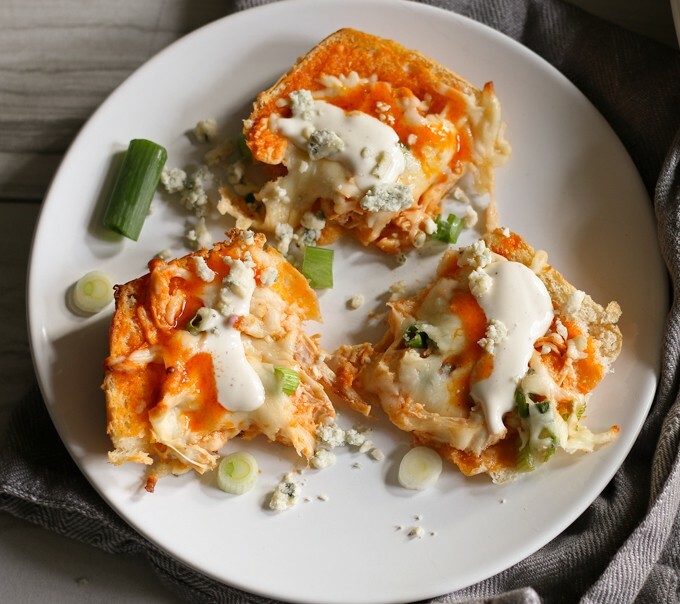 What a delicious use of buffalo chicken- my husband will love these! This looks so good…and I have some leftover homemade buffalo sauce in the fridge thanks to your buffalo sauce recipe! How convenient! 😉 Thanks for sharing! Yum! So delicious and who doesn’t love pizza? Thanks for sharing! This recipe looks so good. Pinned & shared. Thanks for joining the Inspiration Spotlight party! Happy New Year!